Tuesday was my sister’s last day in B.A. and after overdoing it on meat, I decided to take them to a place I heard about in Puerto Madero that’s supposed to be a New York style deli. Unfortunately, we set off in two cabs and couldn’t find the spot so after driving around and around the dock area, we finally stumbled on what we thought was i Fresh Market which turned out to be their newer, larger restaurant concept i Central Market. We walked through the corner entrance and passed by their little takeaway sandwich and salad counter as well a large display case of chocolates, cakes and pastries. There were also a few shelves selling kitchen and home items – teapots, mugs cookbooks, kitchen gadgets to name a few. As it isn’t a casual delicatessen and cafe like the other branch, we decided to sit outside at one of the terrace tables so allow the kids to run around a bit and not disturb the businessmen having lunch in the main restaurant. We had a nice shady table overlooking the sailboats docked in Puerto Madero and a front seat to the boardwalk where all sorts of people were walking by. The menu offers a bit of everything – some pasta, some salads, some sandwiches and a few main courses. There were seven of us plus the baby so we were able to try quite a lot off the menu – some fried calamari (squid rings), a pastrami sandwich, the ravioli, the braised lamb with risotto, a chicken Caesar salad, an arugula-pear salad, a wok stir-fry of chicken, vegetables and rice and the fish of the day which was grouper with a tomato-based sauce on top of thinly-sliced fried potatoes. An assortment of bread and bread sticks were served with slabs of butter sprinkled with sea salt on granite tiles. The food came soon after. Portions were rather generous but we still managed to finish most of it. Prices are a bit steep but I imagine that at their other branch, i Fresh Market, where the menu is simpler, the price must be more reasonable. 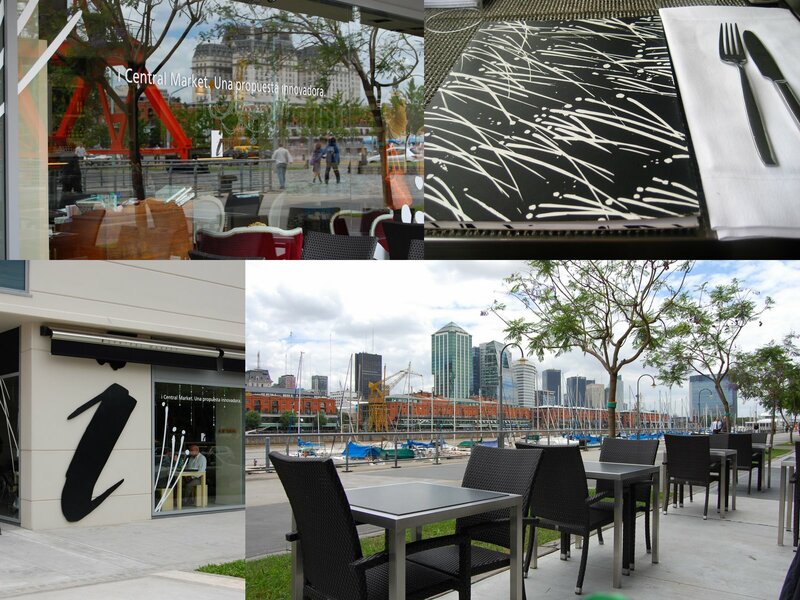 In any case, i Central Market is a good place for a sit-down al fresco lunch with a great view of the river and the renovated brick buildings of Puerto Madero. If you want a quick, casual meal though, better to head to i Fresh Market where I hear that even breakfast is served. That braised lamb dish looks outstanding!Thanks for adding us as a friend on Foodbuzz. We welcome you to come visit our site!